Cruising speed and consumption are using one engine only. Seldon three spreader aluminum section mast by All Yacht Spars Australia, with Dynex runners and Compate 316 S/S standing rigging. Dyneema halyards and running rigging. Hydraulic furling aluminum boom by Leisurefurl of N.Z. with manual override. Carbon fiber spinnaker pole painted and refitted with adjustable stay to mast. 220 volt, 5 batteries charged by: engine, shore power, generator 150 liters per hour Spectra Newport water maker. Victron Phoenix Inverter/charger. For'd is a double berth and immediately aft and to Starboard is a twin berth cabin with shared head. Two rear doubles (2 singles) berth with shared ensuite. Raised deck saloon table and seating for 6-8. Harken hydraulic furlers for Headsail and Staysail. 4 x hydraulic Barient winches, 2 x Harken manual winches & 1 x Harken mast winch. Designed as a racing yacht by David Lyons this 65 foot sailing yacht was built in aluminium in 1996 by Applied Alloy Yachts, Melbourne, Australia and has competed in many Sydney Hobart races, winning PHS Division in 2001 and in her new guise as a performance cruising yacht has recently completed a circumnavigation. Refitted between 2002 and 2004 in Australia, she was reconfigured as a comfortable performance long-range cruising yacht. Additions for her new role include: a new comfortable interior, a new generator, air conditioning system, water maker, additional fuel and water tanks, furling boom, music and video entertainment center and a modern navigation equipment. Although this refit added around 3600 Kg to her weight, she still has a very good turn of speed. Twin 75 Hp Yanmars on Sail Drives mean she is also no slouch under power, a dinghy garage, bow thruster and hydraulic winches complete the package. 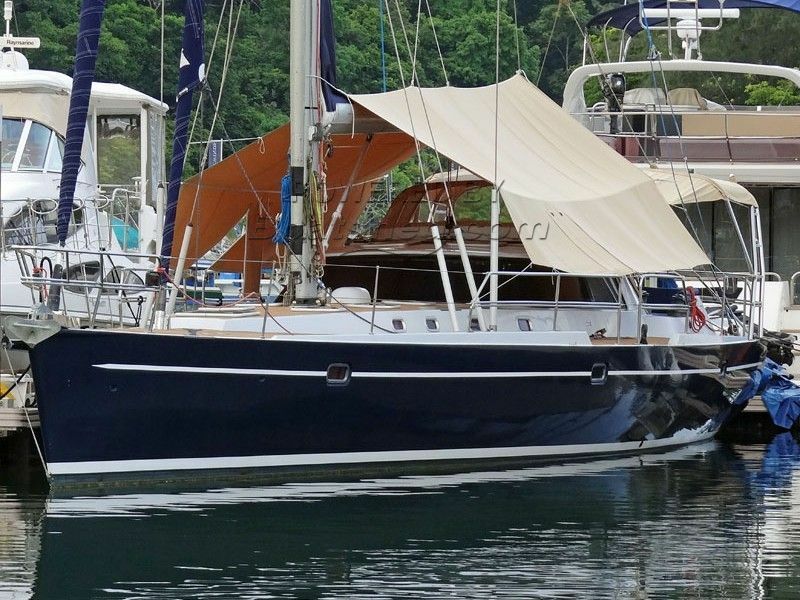 This David Lyons 20M - Aluminium Performance Cruiser has been personally photographed and viewed by Alan of Boatshed Langkawi. Click here for contact details. Please note this comments section is public. Please do not post your personal details here. To enquire about purchasing this boat, please contact the broker directly at boats@boatshedlangkawi.com. Please read our commenting guidelines before posting.